11.30am: Queensland Fire and Emergency Services crews remain on scene at a grass fire burning near Gladstone Monto Road, Boyne Valley. There is no threat to property at this time. The fire is burning safely within containment lines. QFES and Queensland Parks and Wildlife Service (QPWS) crews will continue backburning operations in the area throughout the day to strengthen containment lines. A smoke warning remains current in the area for nearby residents and people residing at the Boynedale Bush Camp. SATURDAY, 9.45AM: A massive bushfire which was sparked yesterday on Gladstone Monto Rd continues to burn this morning after having been monitored overnight. 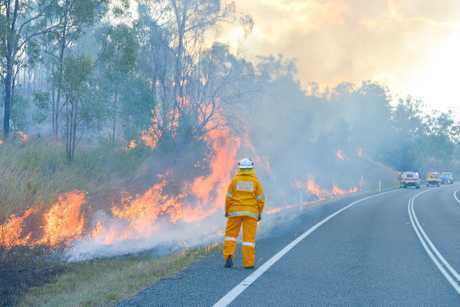 Queensland Fire and Emergency Services said firefighters are planning to conduct more backburning in the area and will continue to monitor the fire today. FRIDAY, 4.30AM: Firefighters remained on scene in the Boyne Valley overnight after battling a massive bushfire near Gladstone Monto Rd yesterday afternoon. The fire broke out shortly before midday yesterday at the intersection with Marble Creek Rd, and was initially reported as the result of sparks from bearings on a trailer. Within an hour the fire had jumped Gladstone Monto Rd and was heading towards Wietalaba State Forest on the western side and Boynedale Bush Camp on the eastern side. Firefighters were unable to prevent the blaze from reaching steep country on the western side, but earlier yesterday evening were still working to put in fire breaks in front of the camp. 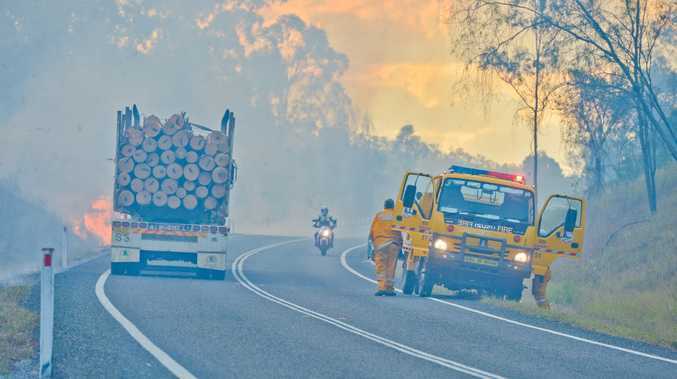 Rural Fire Service Central Region acting regional manager Andrew Houley said frost-burnt grass combined with wind and warm temperatures were behind the fire's quick spread. "We're all hoping for a cold night, that will slow it up to give them a chance to get it under full control tomorrow," Mr Houley said. "We're urging caution for drivers coming through the area (this morning)... if it's a cold night that thick smoke will sit in those hollows like fog." Working with the community: A Rural Fire Service firefighter informs a local resident of the situation. 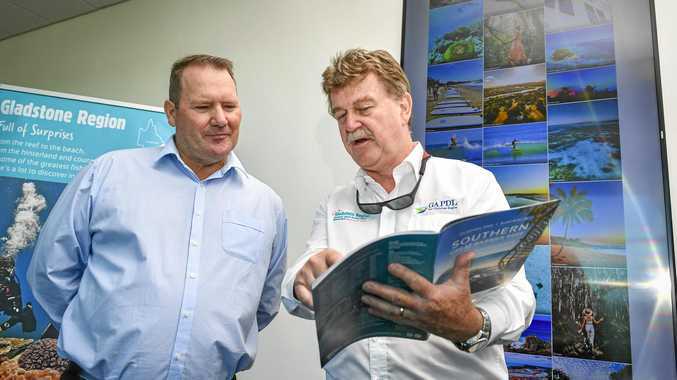 Mr Houley said firefighters were working with landowners and the Gladstone Area Water Board, and would be meeting with Queensland Parks and Wildlife Service this morning. "It's still good conditions for people wanting to reduce fuel loads and do controlled burns... just make sure you contact your local fire warden for a permit because they have the best knowledge of local conditions," he said. THURSDAY, 4.15PM: CAMPERS at the Boyndale Bush Camp are now being moved to a safe location within the campground as firefighters work to create a firebreak between the camp and Gladstone Monto Rd. 3.48PM: RURAL Fire Service area training and support officer Daniel Schneider says the fire was initially reported as being caused by sparks from wheel bearings on a trailer. About ten crews are fighting the fire, including crews from the Gladstone Area Water Board. Mr Schneider says the blaze is currently not under control as it is burning in inaccessible country, though no property is under threat. Monitoring the blaze: Rural Fire Service area training and support officer Dan Schneider addresses the media. 3.30PM: THE fire in the Boyne Valley has burnt through hundreds of acres of bushland and split into two distinct flanks, with firefighters battling the blaze on both sides of Gladstone Monto Rd. Firefighters on the eastern side are back-burning to protect Boynedale Bush Camp, which is packed with people due to the school holidays. People staying at the camp have been informed of the situation. Firefighters on the western side of the blaze are still working to control spot fires by the side of the road. The thick smoke which was billowing from the scene earlier this afternoon has abated to some degree, with police who were conducting traffic control now leaving the scene. No property is under threat at this time. 1.52PM: A LARGE grass fire on Gladstone Monto Rd has expanded to about 400 acres in size and is spreading north west into Wietalaba State Forest. Six rural units are on the scene but are unable to access the fire front due to the mountainous territory. The fire has also spread east towards the Boyne River. Queensland Fire and Emergency Services say there is no threat to property at this time, but nearby residents may be affected by smoke throughout the afternoon. Residents are advised to close their windows and keep medication close by if they suffer from a respiratory condition. Drivers in the fire's vicinity should drive with caution and to the conditions. Anyone concerned their property is under threat is advised to call Triple Zero (000) immediately. 1.25PM: FIREFIGHTERS are struggling to gain control of a large which started beside Gladstone Monto Rd in the Boyne Valley. Rural brigades from Calliope and the Boyne Valley brigades were called to the intersection of Gladstone Monto Rd and Marble Creek Rd shortly before midday in response to reports of a fire about 100 acres in size. The fire has since jumped Gladstone Monto Rd and is heading in multiple directions, with spot fires breaking out as firefighters work to head off the blaze. At least two more rural units are on their way as the Gladstone Area Water Board makes arrangements for a water tanker to be sent to the scene. People staying at the nearby Boynedale Bush Camp have been notified they may need to evacuate if the situation worsens. A large amount of smoke is visible in the area.